CUSAT CAT 2018 Result is declared on 3 May 2018. The students have to download the CUSAT CAT Result 2018/Score Card Online and no separate CUSAT CAT 2018 Score Card would be sent by post. The students can check their CUSAT CAT 2018 Score for all the courses from this page. CUSAT CAT 2018 is a Computer Based Test which was conducted across many centres throughout India. It is to be noted that CUSAT CAT Result and the Rank list is declared in the online mode only and will not be sent by any other means. Cochin University of Science and Technology will soon release Marine rank and counselling schedule. CUSAT Result 2018 (BTech) - Released! CUSAT CAT Result 2018 is available at the Cochin University of Science and Technology official website. 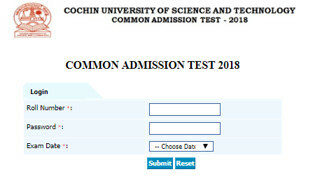 To Check the CUSAT CAT 2018 Result, candidates have to follow the given link and enter their Roll Number and Password. The status whether the student has qualified for CUSAT CAT 2018 would be clearly written on the CUSAT CAT Result. Candidates need to enter their Roll Number in the window given below to check the result. Online registration for CUSAT Counseling will start in last week of May 2018. The candidates are advised to regularly check CUSAT website for updated information about the Schedule of Counselling, Interview, Group Discussion, Admission etc. 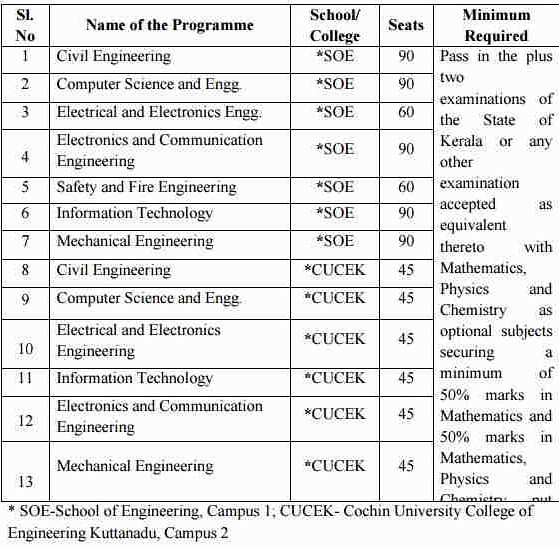 CUSAT CAT Merit List 2018 will be declared for CUSAT BTech Exams Engineering for the academic year 2018. Candidates can check their Rank List here as soon as it is available officially. 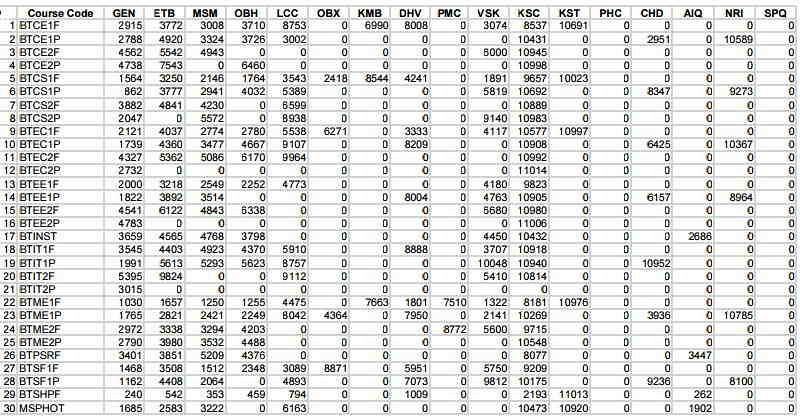 State Merit Seats (SM): 50% of the total approved seats are earmarked as State Merit Seats with low fee rate. The candidates who are Keralite and have mentioned the same in the application form are eligible for State Merit Seats. All India Merit Seats (AIM): 40% of the total approved seats are earmarked as All India Merit Seats. Seats under All India Merit list have higher fee rate. All India Quota (AIQ): 10% of the total approved seats are earmarked as All India quota. All India Quota is for the regular B Tech Programmes viz.B Tech in (Naval Architecture and Ship Building), B Tech (Instrumentation Technology) and B Tech (Polymer Science Engineering) and for all programmes other than B Tech Programmes. Both the Keralite and non-Keralite candidates are eligible for All India Quota. Non-Resident Indian Seats (NRI): 10% of the approved seats of B Tech(self-financing), LLB, LLM programmes and all undergraduate and post-graduate programmes are set apart as NRI seats. 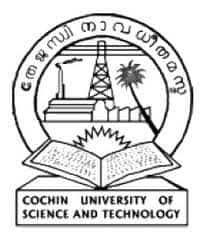 The Cochin University of Science and Technology will release the CUSAT CAT B.Tech Marine Rank List for the candidates who have appeared for the exam. The list will have general rank, marine rank and caster of the candidate. 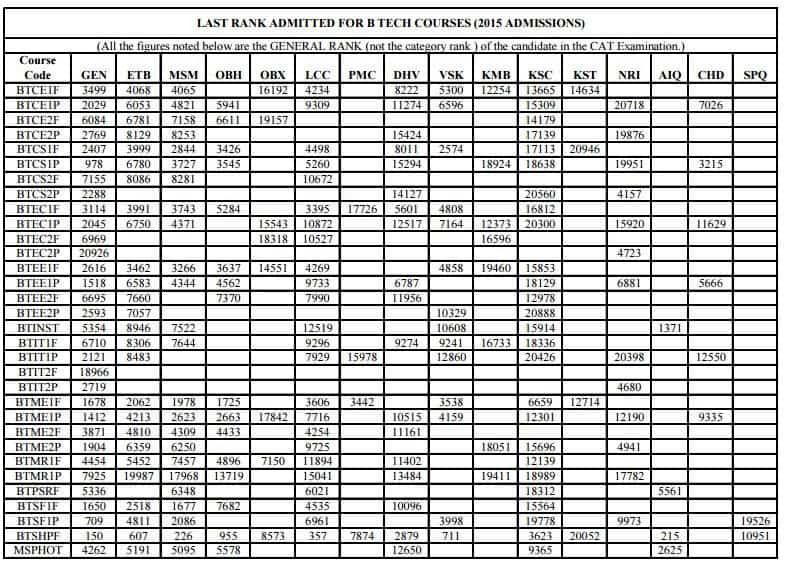 Given below is the Last Rank Report for the BTech Admission officially released by the Cochin University of Science and Technology. Applicants can check the Last rank List showing the rank cutoffs for the previous years i.e. 2015 and 2016 given below. The lists show the courses aligned vertically at the extreme left side of the table and the reserved categories at the topmost row. In case of any query related to CUSAT CAT 2018 Result, write to us in the comment section below.